I just joined the ranks of the uninsured, so health care has been on my mind a lot lately. I didn’t mean to become a statistic. I’d planned to enroll in continuing coverage known as COBRA. That stands for Consolidated Omnibus Reconciliation Act, if anyone’s interested. I still plan to, but futzing around with paperwork has resulted in a delay that will mean three more people will be among the millions of uninsured Americans tomorrow morning. Some organizations put that number as low as 8 million but that figure has enough fudge to cover a mountain of sundaes. “The Kaiser Family Foundation, a liberal non-profit frequently quoted by the media, puts the number of uninsured Americans who do not qualify for current government programs and make less than $50,000 a year between 13.9 million and 8.2 million. That is a much smaller figure than the media report,” business and media.org claims. A figure from Kaiser, hold the fudge: 45 million people in the United States lacked coverage in 2007. And for those insured, it comes at an ever-climbing cost. The average family premium is $12,800 this year, nearly double the cost in 2000, and that’s for less coverage, Kaiser says in a report released last week. That’s causing folks to drop insurance and hope nothing happens. So much for the argument that people are uninsured by choice. A gamble is not a choice. If you lose the gamble, you get thumped hard. My insurer always was kind enough to provide a breakdown as to how much I paid, how much they paid and how much full retail would have cost. Providers use that last figure to soak the uninsured, charging them significantly more than insured patients for the same treatment, according to familiesusa.org. My current plan involves encasing the guys in bubble wrap for the next few weeks so no one breaks anything. With Big Guy, who’s severely allergic and asthmatic, that might not be enough. Yes, COBRA will be retroactive once the paperwork finally is pushed to all the right places, but I envision hours of frustrating phone-tree work trying to get providers to bill me at the insured rate. At least the problem’s temporary for me. It’s not for 45 million other Americans. How will you help, Sens. McCain and Obama? There’s a lot in the health-care position paper on McCain’s Web site that sounds good. What’s not to like about responsibility, affordability and innovation? He says he’ll “look at” drug imports from countries that can produce medication more cheaply than American gougers — Obama favors this, too, but with stronger support. Both have backpedaled in recent weeks. He touts portability — allowing folks to take coverage with them when they change jobs — and that would be huge for people who actually have coverage. The McCain version of portability, though, involves taxing workers’ health benefits as income. That seems to be a clear disincentive to purchase at-work benefits. He also wants to expand Health Savings Accounts. “When families are informed about medical choices, they are more capable of making their own decisions and often decide against unnecessary options,” the paper says. Such as deciding to skip “unnecessary” preventive options because of costs? The HSA change is the second skull atop the three-headed monster . The first is the plan to tax workers’ benefits. 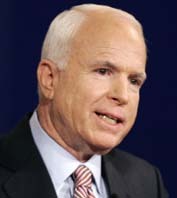 To counteract that, McCain would offer $5,00 tax credits for families to deposit in HSAs. The money would let people buy coverage if they opt out at work. He’ll pay for it through the new tax on health benefits. Except I’m sure it’s just my lying eyes that see it as a new tax, because a Republican wouldn’t propose such a thing. So that’s what he really means by portability. Keep throwing out disincentives for employers to offer benefits and for employees to get benefits through work and, voila! Instant portability. He would drive down costs through competition and “better disease management.” The latter is a stunningly naive notion in a day when most insurers and many employers already bombard folks with such information. He also throws in malpractice reform, a classic position from the right, as a way to cut costs. Not very quickly, though. In its early years, McCain’s plan would actually cost more than Obama’s, according to an analysis by the Urban Institute. Over the long run, the costs are about the same. Is he talking about Wal-Mart? 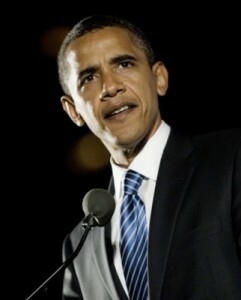 Employers are a current part of the health-care mix, and Obama intends to keep it that way. That makes good policy sense and good business sense, too. Study after study has shown that employers pay for everything depression to diabetes in the form of lost days at work. He also would require employers who offer plans to automatically enroll everyone, in contrast to the current system that requires action to opt in. That alone will result in more people being insured. Obama backs true portability in the form of the National Healthcare Exchange, which would help people find private plans. It would provide income-based subsidies to some. He would mandate coverage for all children, though I’m unsure as to how he would ensure that the mandate’s met. He would prohibit companies from denying coverage based on pre-existing conditions — McCain would “work with” states to create a guaranteed access plan. Obama includes extensive cost-containment ideas rather than relying on the pixie dust of nebulous “competition” and “information.” Some of his proposal, though, also have a certain “heard that before” tone to them. Cutting abuse and fraud in Medicare, for example.